Created at the MIT Media Labs and initially financed with almost $3 Million from a Kickstarter crowdfunding campaign, Formlabs has released their ” Form 1 ” 3D Printer. This $3,299 (retail) unit differs from the market leader – Makerbot Replicator 2 ($2,199) – using a “phtopolymerization” process to create 3D objects. In traditional 3D printing, material is deposited onto a fixed base plate and is built up, layer-by-layer, to realize an object from the bottom up. The Formlabs’ photopolymerization method works in the opposite direction, creating the top layer first which is attached to the bottom of a movable platform. Using a laser from underneath, the resin material in the tray is hardened as the platform rises, building the object one layer at a time. Formlab has simple animated graphic showing how this sterolithography (SL) technique works. This novel 3D printing-by-extraction process, along with the resin material, allows the Formlab’s machine to produce more precise, higher resolution objects than can be achieved with other table top printers. With an additional $19 Million in Series A funding, Formlabs is quickly gaining momentum in a number of applications. Their printers are being adopted by dental supply houses, and individual dentists, to create molds and replacement teeth. Medical offices are building surgical devices and custom prosthetics. Next up from Formlabs is a launch of their proprietary software, PreForm . 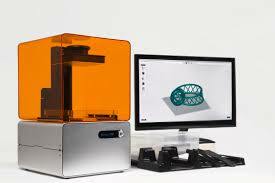 This allows direct 3D modeling to 3D printing with their printers. Rather than using existing 3rd party CAD tools, PreForm will supposedly simplify the concept to creation process with optimizations for the Fromlabs’ photopolymerization process.